Known for its food, beaches, and nightlife, the ancient city of La Coruna has steadily been growing in popularity as a base for travellers in northern Spain. The bustling coastal centre has a busy port, a gorgeously long beachfront, and a reputation for liberalism. La Coruna was first inhabited by a Celtic tribe and was colonised by the Romans in the second century BC (the Romans called the city Brigantium). Today it is a cosmopolitan, proud city, popular with expats: foreigners make up more than five percent of the population. The main attraction for sightseers is the Roman Tower of Hercules, a lighthouse which has been in continuous use since the second century AD and has been declared a UNESCO World Heritage Site. The tower, which has been repaired and renovated many times over the centuries, is surrounded by a large public park and golf course. La Coruna's Old Town, Ciudad Vieja, is picturesque, with some noble old buildings and a lively medieval fair in July, but La Coruna is actually a strikingly modern city. The newest and most talked about attraction is the MunCyT, Museo Nacional de Ciencia y Tecnología, technological museum, a glass and concrete monument to modernism which attracts day-trippers to the city. Another feature that gets visitors very excited is the beachfront promenade, one of the longest in Europe, which winds past many of the city's best attractions, and forms the backdrop for its stunning, urban beaches. 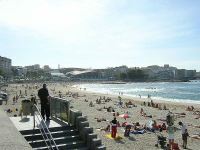 The Orzan and Riazor Beaches, in the heart of La Coruna, are both Blue Flag accredited and immensely popular in the summer months. For delicious and authentic Spanish food visitors should head to the prime tapas territory of Calle Estrella, which is lined with bars and restaurants and will justify the city's reputation as a culinary centre. We are looking for contributors for our La Coruna travel guide. If you are a local, a regular traveller to La Coruna or a travel professional with time to contribute and answer occasional forum questions, please contact us.